In our first blogpost, I’d like to talk about how we incorporated in US from outside the USA. This is a version 3.0 post that is inspired from V 1.0 by my former boss Girish Mathrubootham and V 2.0 by Suresh Sambandam, CEO of KiSSFLOW. This article can not be considered Legal advise, please consult a lawyer and/or accountant before incorporating. The US has one of the most mature banking and financial systems in the world. Owing to this many internet businesses prefer to incorporate in the US. In India the reserve bank of India does not allow businesses to automatically charge user’s credit/debit card’s; explicit user consent is expected via a second factor authentication like an OTP or a password. This hampers the smooth functioning of subscription businesses that charge users every month. However A US based company can store its user’s credit cards and charge them automatically in a recurring fashion seamlessly. For the convenience of auto-charging credit cards many ‘Subscription As A Service’ (SaaS) companies based out of India have their headquartered in the US. US company registration (A Delaware C corp). Registering with the IRS for taxation purposes. A Zero balance US bank account in Silicon valley bank. Access to Legal and Tax consultation from PwC, Orrick and UpCounsel. $15,000 in Amazon Web Services Credits. A Stripe account ready to accept payments. 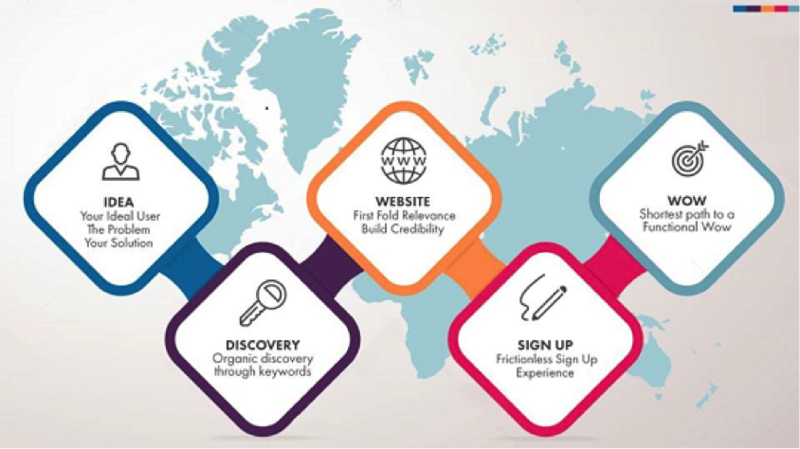 We were skeptical about this program, We even felt it was too good to be true but when we approached Avinash Raghava of iSPIRT and Suresh Sambandam of KiSSFLOW for expert opinion, we were advised to go ahead and incorporate via Stripe Atlas. It was totally worthwhile. 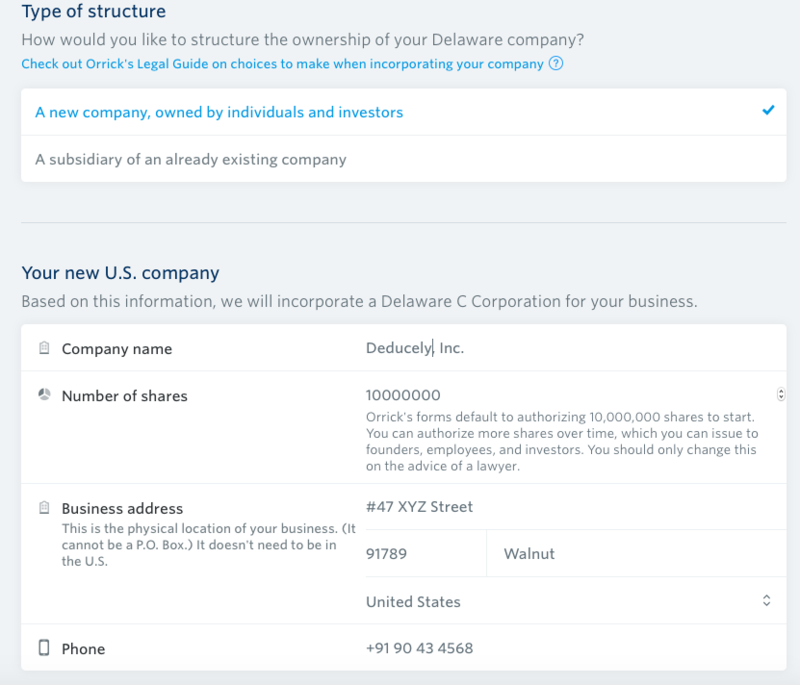 How to incorporate a Delaware C Corp in the USA through the Stripe Atlas program? This is the most difficult part, as of now the stripe atlas program is invite only, you could try requesting an invite on the website or via their twitter account. Once you are successfully invited you’d get an email with a link that can be used to register an account at Stripe Atlas. 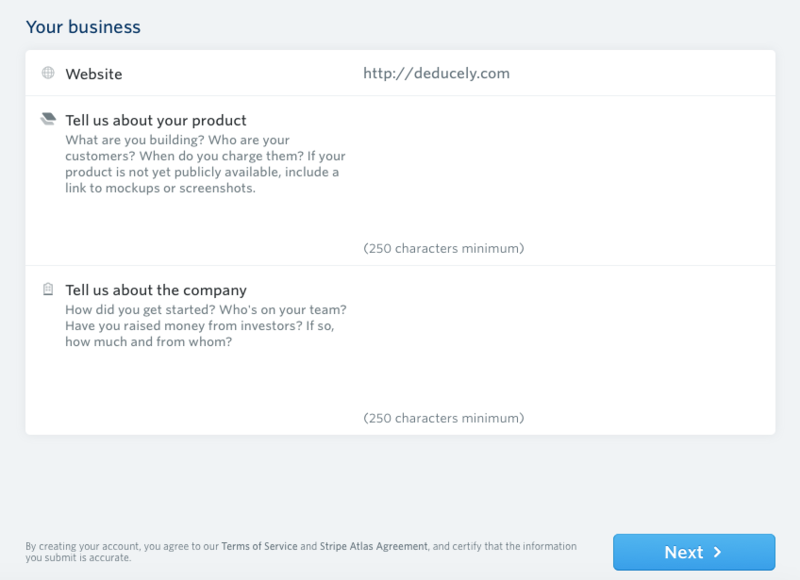 Now You’d be required to create a new Stripe account. There are two ways to structure your company when your business is not physically present in the US. This is a very crucial decision and should be taken after thorough deliberation. We had not incorporated anywhere yet and we went ahead with Freshdesk’s model , so we were asked to enter our company’s desired name, while entering the desired name please ensure that the name is not registered by any other entity, a simple google search could help you out. Although we could have entered our local non US address, we went ahead and purchased a physical address in the US through virtual post mail for $10/month; virtualpostmail.com scan the physical mail that we get and email it to us. We received our ETPS(Electronic tax payment system) credentials through our physical address. Though the US address wouldn’t be of any other use in the immediate future, we wanted Deducely to be global and hence we invested in a US physical address. We got a US phone number for free through Google Voice and entered that as our phone number, to get a Google voice number you need to know someone with a US phone number from a major carrier like Verizon, AT&T, T-Mobile or Sprint. Once the google voice setup is done you will be able to make and receive calls from your US google voice number through the Hangouts dialer app . You could enter your local number here as well. If you choose to set up a US subsidiary with a Non US company as the parent you would be asked to present the Non US company’s tax ID and registration certificate. Please consult your local lawyer and accountant for any regulatory compliances that need to be met. 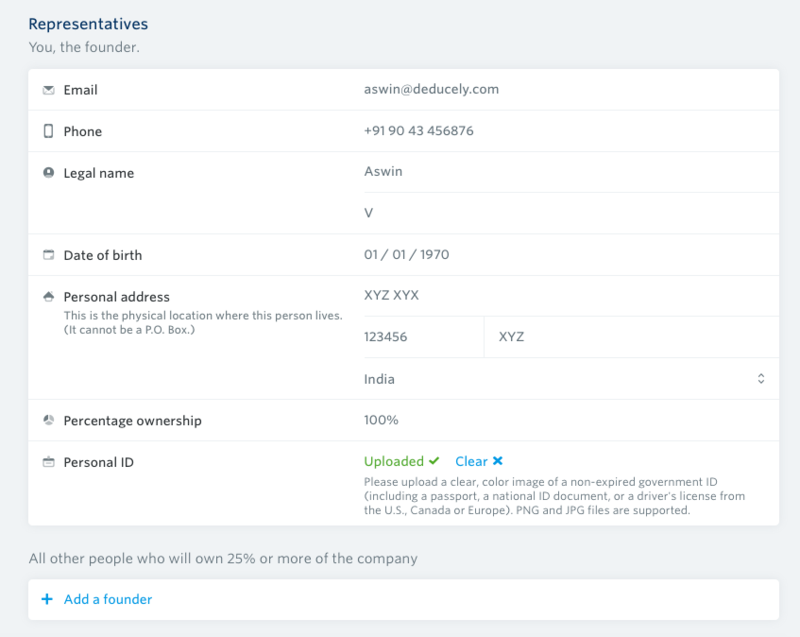 In this page you’d be prompted to enter the personal details of all the people who would have more than 25% stakes in the company. Please have a scanned copy of your passport or any other government issued IDs. Now, in the same page, you will also be asked to select the company’s president, secretary, incorporator and directors. You will be presented with a stripe checkout popup where you can enter your card details. You will we charged $500 USD only after the successful incorporation of your company. After the payment you’d get a prompt saying that your incorporation would be complete in one week. Since Deducely was one of the initial pilot companies to be incorporated via the Stripe Atlas program we did not have to spend a dime to get up and running with a US company and bank account! Thanks a tonne Patrick, we owe you one! I am not sure if this is step would be applicable for everyone. A couple of days after we had submitted our application we received an email from stripe requesting us to furnish details like our estimated timeline, screenshots, Terms of service etc… and we showed them our screenshots and git account; after a few anxious days our application was accepted. I feel this is necessary steps to prevent abuse of this program. After the review process is done and dusted, all the associated people in step 4 would receive an email with a link to a Docusign document. You can read the documents and sign. We would be able to proceed to the next step only when all the associated people have completed signing the documents. $15,00 in AWS credits valid for 2 years. Access to AWS web based training (worth $600). Access to AWS business support (worth $5000). Access to AWS solution architects. After you digitally sign all the incorporation documents , wait for around 5-7 days to get your Delaware C corp incorporation certificate and your Tax ID(Employer Identification Number) from the IRS. Since we had given a PO box address in the US we were asked to give the physical address where our business is present. We emailed this to SVB and after 1 week we were granted access to SVB online banking. 1) Signing the stock plans: Stripe would email you a draft of a Stock agreements, get it signed by your board of directors. Stripe would also schedule a free 30 minute call with upcounsel – a law firm for clarifying any queries. 2) Sending funds to the SVB account: Ideally you can wire funds into your SVB account, but this is a tedious process involving a lot of waiting. We found square cash to be a convenient way to send cash into our SVB account. It takes 2 working days for the cash to show up in your bank account. 3) Getting a credit / debit card : You have funds in your SVB account and you want to pay for your hosting and other subscriptions, there are two options that I am aware of, the first method would be to apply get a business credit/debit card from SVB and get it delivered to your address. The second method is signing up at privacy.com. Privacy.com is a new age fin tech company that links with your bank account, through this service you can generate virtual VISA cards with fixed spending limits and close them whenever you want. We use privacy.com to generate virtual credit cards and track our spending. This service is free! 4) The Unofficial Stripe entrepreneurs Facebook group: If you are not based in the US and have a US based company , we have created an unofficial stripe atlas entrepreneurs group in Facebook . You are not alone here, if you run into any issues or need help you can ask other fellow atlas entrepreneurs for help. 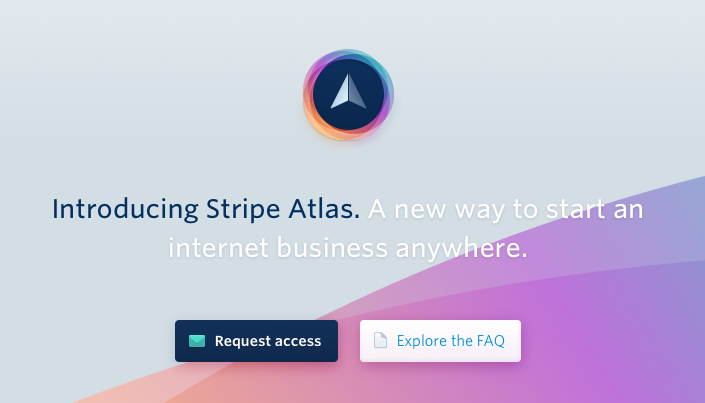 Overall our experience with Stripe atlas was exemplary. Their support team always had our back; I’d like to give a huge shoutout to Anita from the Stripe atlas team, she was not only very knowledgeable but also very patient in replying to the barrage of queries that we raised every day! Ideally a service like this would cost you at least 800$ without the bank account and $15,000 in AWS credits. Stripe Atlas = A happy meal for company incorporation! The morning of the SaaSx2 event saw a great pre-event playbook at the Attune Tech’s Office. Avlesh from WebEngage, Arvind from Attune Tech. and Suresh from KiSSFLOW came together to host the session and anchor the round table. Identifying the ideal user for your product is the key to your entire product. Is it a product for developers? Is it for CEOs? Is it for mobile users? Is it for users of spreadsheets? Once you identify your user, identify the ‘buying title’ and the ‘influencing title’. The ‘buying title’ would be the shot-caller whereas the ‘influencing title’ would play a major role in influencing the shot-caller to buy your product. Sometimes, if your on-boarding process is straightforward, you can sidestep your segment. Figure out what’s happening, is your product gaining traction, etc., And then iterate your product. This is when Avlesh (Webengage) (he was lost in the land of Chennai, damn the cabbie) joined the discussion. He stated a very crucial point, that sometimes entrepreneurs forget during their journey of building their product. “Try aligning your product to your users’ metrics” was a great insight from him. If you’re launching a second product, run it by your current customers. What’s that one thing that your user can relate to? What does he/she get out of this? What are you improving for them? These are very practical and a data-driven points to consider before taking that step forward towards your market fit. Arvind, connected these points to the psychological concept of ‘Instant Gratification’. What pain point are you trying to address? What’s that ‘wow’ moment they get when they start using your product? Something as simple as what they do everyday and how you can help them do it differently. If users get an immediate result from your product, they would be hooked to it. 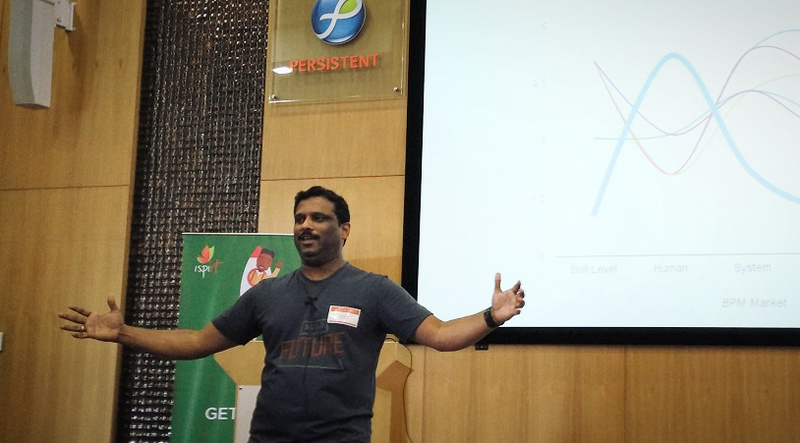 Suresh mentioned a very simple but powerful point to elucidate product market fit. He also spoke about how product fit is not necessarily a price fit but much more than that. If users love your product, they really wouldn’t mind shelling out some extra money to buy it. If you had noticed, all these points have something to do with user engagement. Users see. Users love. Users buy. Users stick on. Product Market Fit isn’t a destination you aim to reach, but it’s a continuous journey. Here are a few pointers to follow before you set out to find your fit. Don’t go after a broad range of things. You can’t be everything for everybody. Identify your segment. Your niche. That sweet-spot! Then, iterate your product. Strip/add features to suit the market. Mohit from Jombay, who had some thoughtful points to add on to the entire discussion, mentioned about how it’s important to know what to focus on! Positioning your product is a prerequisite in obtaining a market fit. When do you know your product has obtained a market fit? To understand the answer, ask this question. Are more strangers paying for your product? (not just your mom’s friends or cousin’s colleagues). Are you solving your users’ problem? Sean Ellis answers this beautifully, in his blog. Product market Fit isn’t a destination, it’s a journey. It’s not about the product. It’s about how you position it. Align your products to your users’ metrics. Avlesh’s sense of humor, Arvind’s sarcasm and Suresh’s guffaws helped maintain a lively atmosphere for the discussion 🙂 It was a great session overall with some brilliant takeaways from all of them. To apply for this PlaybookRT please fill up the online application and we will get back to you. The session is open to the company’s Founding Team, CEOs and/or head of Sales. Applications are due by the 22nd July 2015. The goal is to have at most 12 companies so as to make the interaction effective. If there are other interested attendees, we will arrange subsequent RoundTable. This PlaybookRT is FREE and there are no charges. Suresh Sambandam is the Founder and CEO of OrangeScape, that specializes in building technology platform software. OrangeScape offers two platforms – Visual PaaS – a cloud application development platform for Large Enterprises and KiSSFLOW a workflow-as-a-Service platform for SMBs. OrangeScape has marque enterprise customers include the likes of Unilever, Citibank, Pfizer, AstraZeneca and its KiSSFLOW is #1 in the workflow / SaaS BPM space with 9000+ customers across 108 countries with a truly global footprint.